Home of the professional invesitgators and researchers, where common sense and logic rule over evidence . If you need the PROS Team to investigate your home or business click below. Check out our media / video events with News 9 and Univision. Under Tours/Events tab on the top of this page. Watch the transformation from relic to reality. While your here don't forget to pick up a T-shirt! P.R.O.S Investigations is a group of like minded people that pursue a common passion to learn how the world around us functions. Some of our members have over thirty years experience in research, investigations and events considered paranormal in nature. Since the beginning of time people have had a fear of things they do not understand. Wind, rain, and lightening were all considered paranormal at one time. Through science and the determination of curious people that were willing to take the criticism and stigma for questioning the unknown, and at times, the religious beliefs of their community, many things have been explained. Thanks to some of these early investigators, giant leaps in understanding and technology has changed the world forever. One should also keep in mind, we only use a small percentage of our brains. What are the possibilities the unused portions allow one person to see and hear things others cannot? P.R.O.S Investigations does not expect to change the world, but we do share the enthusiasm and curiosity of these early investigators. Paranormal investigation is a vast field. Ghosts are just one part of the mystery, psychics and mediums, psychometry, clairvoyance, and telepathy are other mysteries of the paranormal field. Experiencing the paranormal can be frightening to many people Knowledge of what is happening to them is the first step to removing that fear. P.R.O.S has three members on staff who have attained certification in parapsychology, and other members are pursuing their certification. Some members have many years of research into the paranormal. We want to have the knowledge to address questions of the paranormal no matter what area of parapsychology it pertains to. The LTRS is our research site where we study the paranormal. The LTRS is an old warehouse dating back to the late 1800s. Paranormal activity has been reported there for many years. Research is done by taking a subject and measuring it's responses to different stimuli under controlled conditions and recording the results. Normally research is done by taking the subject of study to a lab. In paranormal research you have to take the lab to the subject. That is what we are doing at the LTRS. We have set up live camera feeds 24/7 to our website so anybody can observe activity along with us. We also have a live audio feed to hear what is happening in the building. We have experiments set up in different areas of the building to document kinetic activity. We have measures in place to inform us of exactly who and when anybody enters the building. We at P.R.O.S want you to study with us. We do our research starting about 700-900p.m. during the winter and at about 12:00 a.m. during the summer. The investigation is broadcast live on this website. Join our chat and participate in the investigation. We are in touch with the chat room to answer questions. We at times take questions from the chatters and ask them during sitdown. Everybody is welcome. Be sure to catch one of our paranormal seminars and public investigations of the research site. The tour is full of information about paranormal investigating and historical facts and stories about the nearby station. If you can't make our scheduled tours, get a group together and book a private tour. Check out our Tours/Activity pages for more details. P.R.O.S. is dedicated to research of the paranormal but one of our main purposes is public education. We are always available to anyone with questions or are in need of an investigation. Our services are always free of charge and strictly confidential. 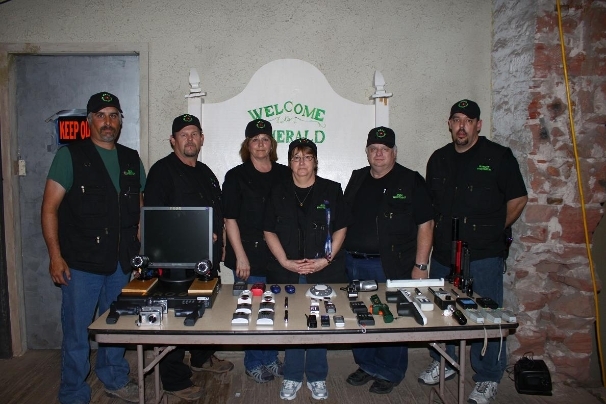 Just contact us at prosghosthunters@yahoo.com. Ghosthunting is done by amateurs/ thrill seekers. Currently PROS is no longer conducting ghost tours. Click the Tours/Activities tab for more details.